Creating textured 3D meshes of objects for real-time applications can be a laborious, slow and expensive task, demanding specific, highly specialized human resources such as 2D and 3D artists. 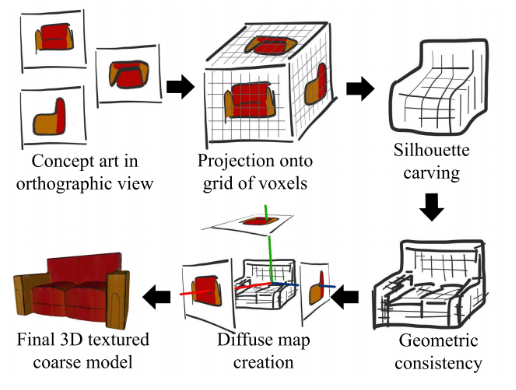 In this paper, we present a fully automatic 3D modeling method- ology based on silhouette carving, capable of creating textured 3D meshes from three pieces of concept art. Our method takes a set of the target object concept art in different views as input and generates a coarse 3D mesh alongside a diffuse color map for textur- ing the model. The coarse mesh is intended to replace the initial primitive mesh used on the modeling technique known as Box Modeling to accelerate the whole 3D model production. Although, in current 3D model production pipeline there are some more so- phisticated methods based on sculpting and retopology, Box Modeling is still a heavily adopted technique used for man-made objects that do not require organic modeling. Our experiments show that it speeds up the 3D content production time up to 40% by provid- ing the coarse model automatically. Also, our method preserve the artist’s trace and can create more accurate meshes compared to a similar approach, photoconsistency-based, and learning-based methods.